Former Dublin GAA dual star Conal Keaney and soap actress Amilia Clarke Stewart came out to support the Dublin Simon Community today as it launched its 2016 Simon Fun Run. 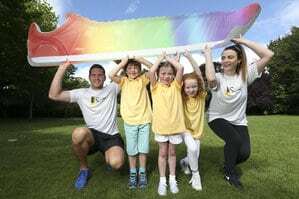 The Ballyboden St. Enda’s man and the Carrigstown resident are encouraging the public to grab their running shoes on October 1st and run, walk, dance or skip around the Phoenix Park at the 33rd Simon Fun Run. Conal and Amilia were joined on the day by Katie Byrne (9) from Clondalkin, Phonsie Wardell (7) from Wicklow, and Coleen Brennan (6) from Kildare. The Simon Fun Run is chip timed and a professionally organised and registered race with Athletics Ireland. There will also be a return of the Hamleys Kids Zone, Deutsche Bank Kids Races, Simon Food Court, live music, performers, and many more activities in store. Register for this year’s Fun Run by clicking here and find further details at www.funrun.ie. If you would like to speak to a member of the Fun Run team, then please call 01 671 5551 or email Grace at graceallen@dubsimon.ie.